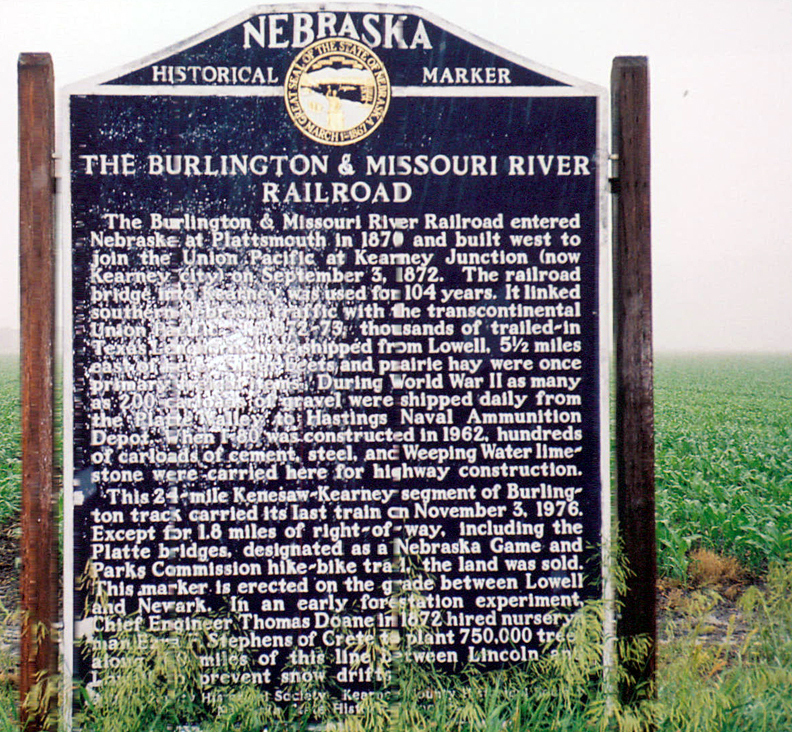 The Burlington & Missouri River Railroad entered Nebraska at Plattsmouth in 1870 and built west to join the Union Pacific at Kearney Junction (now Kearney city) on September 3, 1872. The railroad bridge into Kearney was used for 104 years. It linked southern Nebraska traffic with the transcontinental Union Pacific. In 1872-73, thousands of trailed-in Texas Longhorns were shipped from Lowell, 5 1/2 miles east of here. Sugar beets and prairie hay were once primary freight items. During World War II as many as 200 carloads of cement, steel, and Weeping Water limestone were carried here for highway construction. This 24-mile Kenesaw-Kearney segment of Burlington track carried its last train on November 3, 1976. Except for 1.8 miles of right-of-way, including the Platte bridges, designated as a Nebraska Game and Parks Commission hike-bike trail, the land was sold. This marker is erected on the grade between Lowell and Newark. In an early forestation experiment, Chief Engineer Thomas Doane in 1872 hired nurseryman Ezra F. Stephens of Crete to plant 750,000 trees along 100 miles of this line between Lincoln and Lowell to prevent snow drifts. 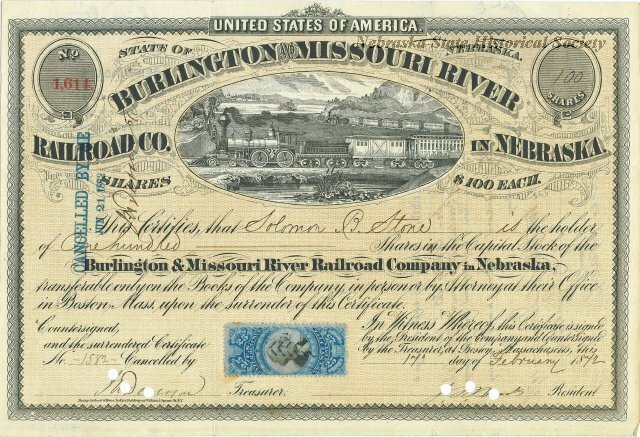 “The Burlington and Missouri River Railroad,” Explore Nebraska History, accessed April 18, 2019, https://mynehistory.com/items/show/298.